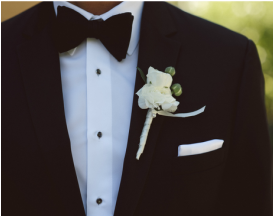 The Surepin® - Floral Pins That Make Pinning a Boutonnière or Corsage Easy! "Having been an educator for the past thirty years, my profession was based on observation and implementing changes to help all students. Observing the drama and difficulty with attaching boutonnières seemed frustrating to me. Consider making this pleasurable for your customers and they will be so happy with your floral shop's service!" 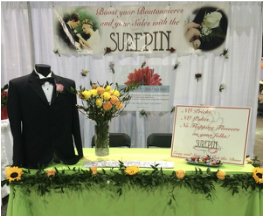 The Surepin® was created with both the florist and the customer in mind. 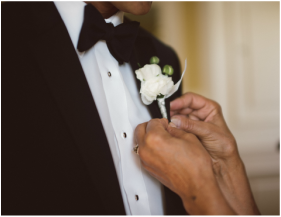 It can be inserted into the finished boutonnière​ using your finger or a flat edged tool and the customer receives it ready to pin! Flowers stay beautiful for hours! Standard straight pins disturb the system of the flower when placed crisscrossed to secure. The Surepin® simply goes straight up the flower, allowing it to stay fresher longer. As florists, we know your time is your most precious resource. Using The Surepin® allows you to go about your designs without restrictions or extra work. Simply insert the bent part of the pin into the base of the flower when you are done! "No pricks, no pokes, no flopping flowers on your folks! Just easy and sure and out the door!" Take your service one step further by providing an easy and seamless pinning for your customers. They'll be sure to come back!